Every city and town has a unique feeling and energy to it. Step into some and you feel right at home, others may not feel like the place for you. Sedona’s energy might be the most unique of any city or town out there, though. The energy, which is largely the product of its vortexes, truly empowers you. 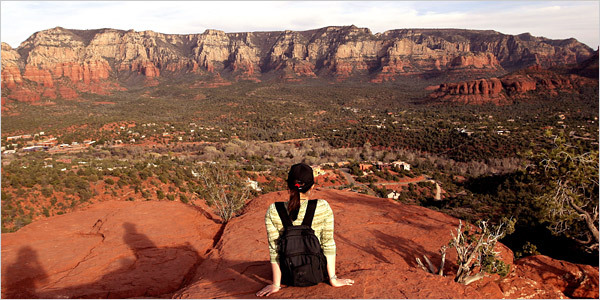 There are four main energy vortexes in Sedona: The Airport vortex, Red rock Crossing/ Cathedral Rock Vortex, Boynton Canyon Vortex and Bell rock Vortex. Each vortex strengthens a unique part of those who traverse its grounds. Stand at one of Sedona’s four main vortexes and the energy will flow into and through you. You may find that you feel more confident, more empathetic, or more at peace depending on the vortex you step into. Each vortex helps with a specific energy. Travel Tip: Don’t be closed off to the workings of the vortex, the more sensitive you are during your vortex excursion, the better the experience. Posted on August 4, 2014 by Gretchen Burnton in The Great AZ Road Trip | Tags: Arizona, meditate, Prescott Area, Rim Country, Sedona, tourism, Verde Valley, vortex | permalink.